Ludic Moments examines the current state of the emerging field of humanities-based research into computer games. 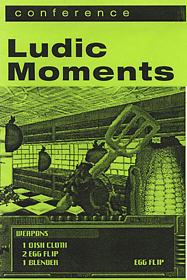 Most of the papers in this issue were presented, in different form, at the conference Ludic Moments: Computer Games For The Time Being, at Artspace, Sydney in May 2003. This event, organised by Patrick Crogan and sponsored by the Macquarie University Media Department and RMIT, was the first symposium in Australia wholly devoted to the study of computer games from the perspectives of critical and cultural theory of contemporary audio-visual culture. Keynote speaker at the conference was Espen Aarseth, who is interviewed by Patrick Crogan in this issue of Scan. This issue also includes an information section of non-refereed pieces: a survey of recent "game hack" practices and reviews of recent international conferences on gaming and virtual storyteling. Several of the pieces in this issue of Scan are published in altered form in a publication by Artspace edited by Patrick Crogan, Ludic Moments: Computer Games For The Time Being. The article by Chris Chesher was presented at Plaything, the digital games/art symposium held at University of Sydney, October 2003. The articles assembled in Ludic Moments explore the divergent responses to computer gaming - as a form of program design and aesthetic practice specific to computer games, or more generally as a key to understanding computer mediated interactivity across a wide range of creative expression.